Fishing and comfort are not always two things that go together. 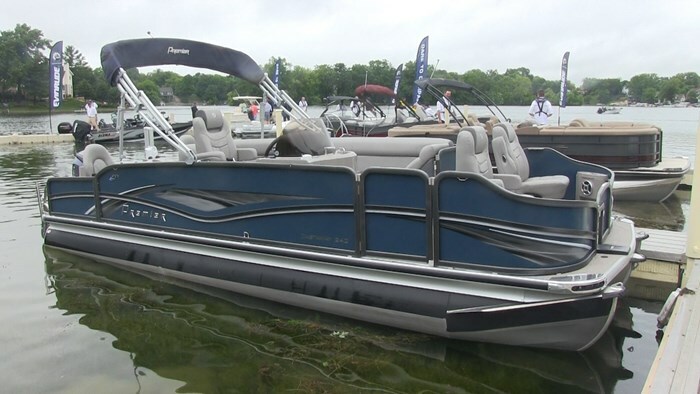 I mean sure, there are fishing pontoon boats, but it seems like if you like to fish then you’re not allowed to have a nice pontoon. You then have to start to weigh out your options and which would you rather lean towards, the fish or the cruising. Premier finally said “No! You can have it both!” as they released their 2016 Cast-A-Way 240. If you go to Premier’s website you will see at the top it says “Pontoons” with a drop down menu that has 5 different levels. What they have done is categorized all of their models by levels based on the trim package. For all intents and purposes I’m not going to even count level 5 as one. They are some serious pontoons, in fact we tested one of them at the Miami Boat Show, read the review here. With level 5 excluded for the purposes of this review, the Cast-A-Way 240 falls into level 3, which is second from the top. When you walk up to it at the dock it certainly looks that way also. One of the ways you can tell a fishing pontoon boat from afar is that the gates usually dip at the bow, and sometimes the stern as well. This gives the customer less of a distance they need to pull the fish into the boat. Premier has gone and built this functional design into the form of the boat, creating a unique style that offers eye catching curb appeal. A swoop in the mid-ship is accented by vinyl graphics that blended in nicely with the navy blue aluminum panels. Walking inside of the Cast-A-Way 240 if you didn’t know what to look for in a fishing pontoon then it would be hard for you to know it was a fishing boat - and I mean that as a compliment. The first tell tail is two fishing seats in the front. These are usually, small, “clam shell” style seats. Well on the Cast-A-Way they’re high backed, captain’s chairs with arm rests. 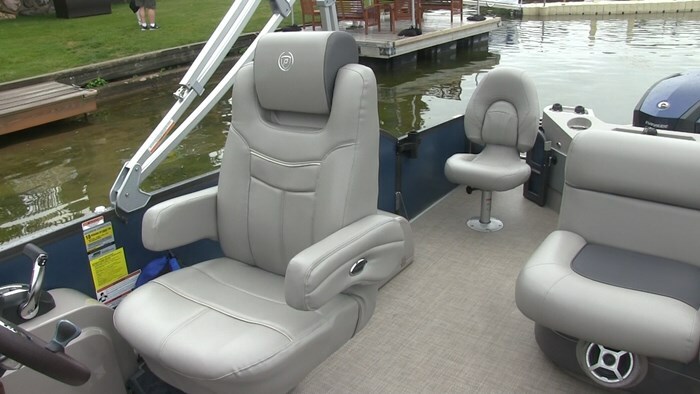 In the corner forward of each chair is a speaker, drink holder and tray, perfect for quick access to fishing gear. For those with no interest in casting a line, worry not as you will be well taken care of. You can stretch out on the over-sized L grouping that’s across from the helm. Multiple people can sit around the removable table still leaving room for someone to stretch out with their feet up. 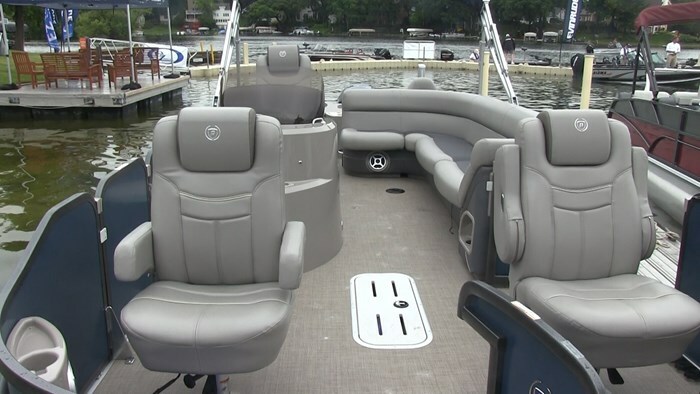 The upholstery is called their “Heritage Fabric” and has a distressed leather look to it that’s as soft as it is stylish yet it’s strong and durable to withstand the abuse of every day boating and even fishing. Premier likes to name everything in the boat and the helm is no different. The Spincaster helm features a windscreen, a leather gauge hood and faux wood accents. There is a pair of gauges that centers around a blank center section that you can use to mount your favourite fishing graph, or in our case it had the multifunction gauge for the 250-hp HO Evinrude G2 Outboard on the back of the Cast-A-Way. Forward of the helm, but built into the same stand is a sink, along with a bow live-well. 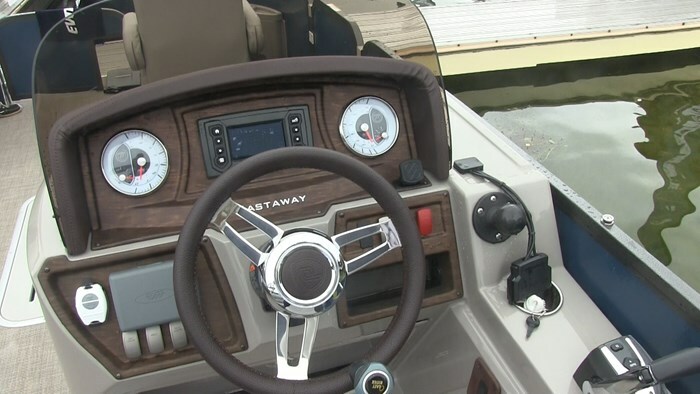 Directly behind the helm is in floor rod storage that locks for when you want to leave the gear in the boat with a little piece of mind. If you have ever seen highlights of a serious fishing tournament on the web one of the things you might have seen during the morning of each tournament is something called “the blastoff.” All of the fishing boats gather out front of where it’s being held and then it’s go time - they all take off and race to their fishing spots. It’s basically first come, first fish. The reason I bring this up is because my dream has always been to enter a pontoon into a fishing tournament and be out there, idling in the pack, waiting for the blast off. There would probably be some funny looks and some snickers, but when that horn sounds and they see the Cast-A-Way 240 shoot past them as we get on plane in just 3.5 seconds the funny looks will turn to looks of surprise. We would immediately pass the slower boats, then the middle of the pack boats. But we’d be able to get to our fishing spot fairly quickly with top end cruising speeds anywhere from 42 to 47 mph. In a 24-foot pontoon that is nothing to snicker over, let me tell you. Part of that great performance is thanks to Premier’s exclusive PTX performance package. 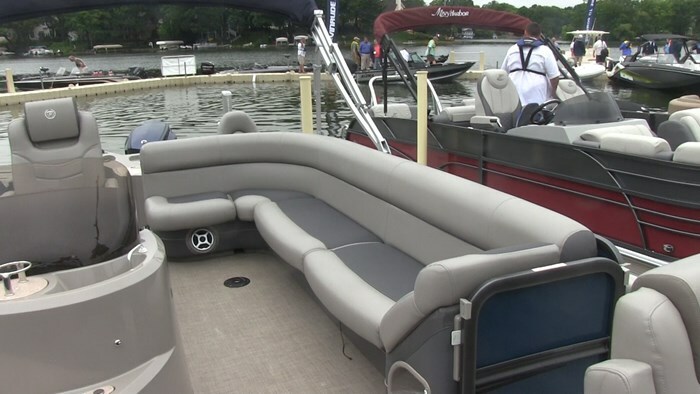 The major standout on the PTX Package is the oversized center pontoon. The key being if you make the center pontoon larger, you have more volume which gives you more buoyancy. Additionally, the center pontoon isn’t round. It has bevelled edges and a flat bottom giving it a U-Shape. Not only that but the flat bottom is going to give you more running surface along with more lift. For that extra lift to get up on plane and reduce drag there are positive angle lifting strakes on the inside of the two outside pontoons. What this all means is that any Premier with the PTX Performance package will handle incredibly and the Cast-A-Way 240 was no exception. 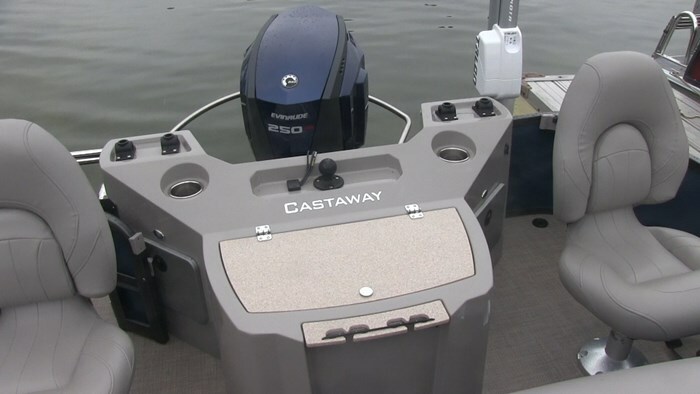 It helps that it had an Evinrude ETEC G2 powering it as well. Each G2 ETEC comes with built in power assist steering, so you are going to be able to push the Cast-A-Way to the limits without having to give your arms a major workout. Now keep in mind that I am a boat driver, not a fisherman, but to me it only makes sense that the smooth shifting and acceleration of the digital shift and throttle would avoid spooking the fish. Some engines have a defined “clunk” when shifting in an out of gear but with it all being drive-by-wire technology there is no “clunk” it’s a smooth transition, which you would think would allow you to be stealthy to sneak up on that trophy bass. One thing I like about the Evinrude G2’s when it comes to fishing is that when you have kids in the boat it’s not a matter of if they are going to get the hook caught on something, but when. Well every G2 has a “clean rigging system,” meaning all you see going into the engine is one tube, about 2 inches wide, that has every necessary hose and wire. 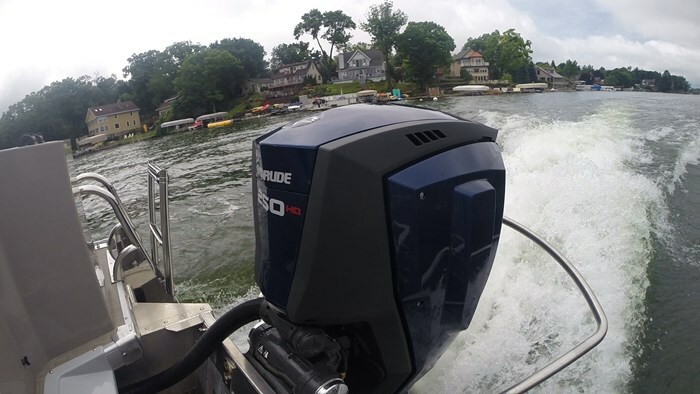 This stems from the original mandate that Evinrude wanted to be able to have a motor they could rig on a boat in 15-minutes. Well this clean rigging system gets rid of all of those extra cables and hoses that would create a potential catch point for a youngster’s hook if they are fishing from one of the two stern fishing seats. Sticking on the subject of smoothness, I was quite impressed with how smoothly the Cast-A-Way cruised along. We were testing this boat at an Evinrude media event so there were multiple boats buzzing around, like flies over spilt pop on a summer day. This created fairly rough conditions and the boat used its extra buoyancy from the PTX to stay above the chop and skip across it, rather than plow through the way a V-bottom boat does. At the core, that’s how these big pontoons ride so smoothly, they ride on top of the water, rather than cutting through it the way a traditional boat does. This creates an exceptional ride in all conditions, but also giving you incredible top end performance and as we experienced with the PTX Performance package, hair raising handling as well. In the past a fishing pontoon were for those who wanted to slow down, who weren’t in a hurry. But now they’re for everyone, you can bring a crowd and not everyone has to fish. You can get to that spot down the lake sooner and you won’t disturb the fish when you get there. But if you decide to enter your Premier Cast-A-way 240 into a fishing tournament, let me know because I want to come!